All of this feedback – constantly monitoring, recording and influencing your life as an athlete – is painfully rooted in the very one-dimensional world of physicality. Lap times, rep counts, weight targets – all incredibly important, yet lacking in presenting you with an evaluation of your psychological state, which is a chronically overlooked area of sport and fitness in general. Okay, so you weren’t able to complete your intensely desired one rep max for bench press. You got crushed at last weekend’s tournament. Cue demoralization and self-doubt. On paper, you were flawless, tirelessly adding weight at the precise increments and never failing to complete every piece of last month’s practices. So what gives? Where do you look for reflection and answers when your routines are completed loyally? AthleteMinder, the new mental training app from sport psychologist Dr. Mara Smith, might just have the right blend of fresh insight to shed light on otherwise neglected aspects of progression and deliver some healthy improvement. No stranger to the game, Smith has flexed her 20 years of experience and education through many outlets, including consultation with numerous sporting entities: USA Hockey, USA Gymnastics, US Figure Skating, USA Bobsled and USA Luge. So what’s up with the app? 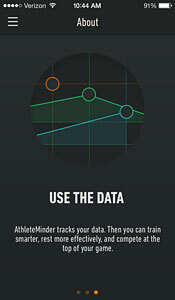 AthleteMinder is her latest project, and the app itself is interesting and easy to use. A few workouts in and I found myself pleasantly looking forward to using it, plus milling over some of the useful information on how I was stacking up mentally from day to day. Personally, I love fitness apps, use STRAVA religiously and looked forward to trying out something that didn’t display the stereotypical variables that make up most of the more popular options. AthleteMinder differs in the fact that it is very personal. No clogged leaderboards or sharing options — just you, your reflection and trends of this over time. 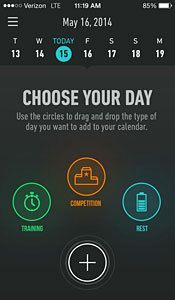 Actually, using the app couldn’t be any simpler: Just choose from one of three options on what kind of day you had – rest, practice or competition – and then answer five key questions about the session that relates to the mindset surrounding it. These questions were researched and chosen by Smith after surveying athletes from several sports and ability levels on what is most applicable to gauging performance. The answers are then recorded, analyzed and presented in a summary graph, which gets plotted on a calendar and spiced up with tips on how to enhance progress. After a few entries, you can see trends starting to carve out, allowing for some really cool insights to be formed. I had the pleasure of speaking with Smith about AthleteMinder, and her passion for the app was contagious. She has a genuine interest in bettering the mental health of those involved in fitness and a desire to keep developing the app to better meet the needs of users. Not everyone has the chance to work with a sport psychologist or mental strength specialist, but $1.99 sure as hell isn’t hard to come by. If you’re looking to gain an edge on your game, do yourself a favor and check out AthleteMinder.